If you think Goa is all about beaches, pubs and churches, then you haven't still explored its actual beauty and you really need to take up the expedition of scrutinising its corners. To your surprise, it is also home to numerous ancient monuments, wildlife sanctuaries, forests and hills. So, how about exploring the other side of Goa this season? If you would love to travel offbeat, then plan a tour of the Tambdi Surla Mahadev Temple. The natural surroundings, architectural beauty and the historical significance of the temple will certainly leave you awestruck. Well, read on to know more about this wondrous monument and how to reach it. 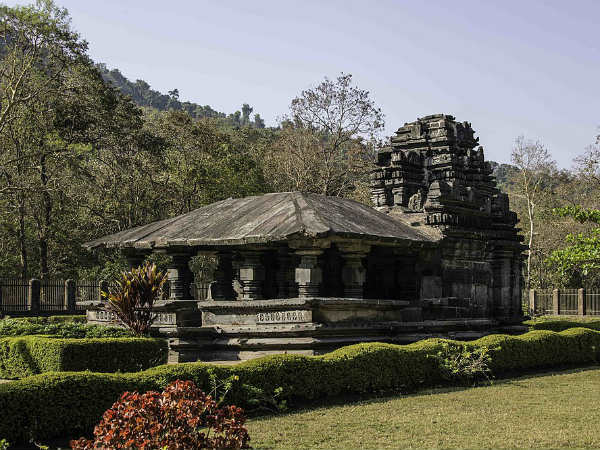 The temple is surrounded by lush green vegetation, and hence maintains a bearable climate throughout the year. Hence, it can be frequented anytime during the year. However, if you are looking forward to avoiding the humidity and the summer heat of Goa, then the best time to visit it is from September until the end of February. Surrounded by a forested land, Tambdi Surla Mahadev Temple is said to be the oldest temple in Goa. Yes, as per historical records, the temple was established in the 12th century by a minister of the Yadava King Ramachandra. Even though the temple is built in the Jain style of architecture, it is dedicated to Lord Shiva. Therefore, it is of great cultural as well as religious significance. As the temple is located in the midst of lush vegetation and is blessed with a serene aura, it wouldn't be wrong if we say that the temple is nestled wonderfully in a heavenly land. While exploring its architectural beauty, you can get lost in its peaceful environment. It is visited by hundreds of tourists and locals every year. However, it is still an unknown destination amongst common tourists. Considering its architectural and historical importance, it must be visited by every traveller. However, if you are not one amongst those offbeat travellers, then also you must plan a tour of this wondrous beauty as it is one of the few places in Goa where you can enjoy the essence of composure and calmness. Do you know the region around the temple is also blessed with several other natural sites, such as waterfalls? Yes, Tambdi Surla Waterfall is located in the vicinity of the temple and is an ideal place to detox yourself. If you are tired of visiting the same old and crowded places in Goa, then you must plan a tour of this beautiful temple that has in store a lot to be witnessed. Most Read: How To Explore The Beauty Of Goa In 24 Hours? By Air: If you desire to travel by air, then you can take a direct flight to Goa Airport, which is located at a distance of about 70 km from the temple. From the airport, you can hire a direct cab to reach Tambdi Surla, where the temple is located. By Rail: The nearest railhead to the temple is Kulem railway station at a distance of about 21 km. From the station, you can easily get a cab to reach the temple. By Road: The region in and around Tambdi Surla is well connected to all other places by road. Hence, you can easily approach the temple by road.